Kerry football captain Fionn Fitzgerald. THERE’S A HIGH level of anticipation surrounding the young talents Kerry will release as they begin their championship campaign next Sunday. Kerry’s captain has been working closely with those players on the training ground and has got to observe some on the pitch as well. Lecturing in IT Tralee in the Department of Health and Leisure, Fionn Fitzgerald’s day job sees him instructing some of Kerry’s brightest football hopes. Hype blazed around Clifford as he stepped into the senior arena in late January against Donegal but Fitzgerald feels that has cooled sufficiently now and the Fossa teenager is able to cope. “There was at the start now, but David, he is a level headed guy. He wants to play with Kerry. He is enjoying playing with Kerry. Being placed under the microscope is not a scenario that is just the preserve of Clifford. 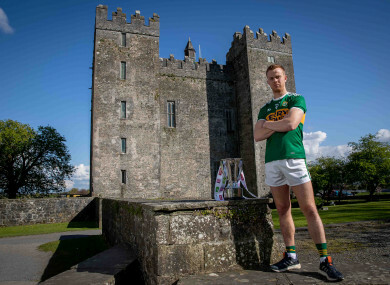 For the entire Kerry squad, there are constant demands from their expectant fans, which have only been heightened by the manner of their 2017 exit at the hands of Mayo. Fitzgerald does not find it suffocating, instead he embraces it. “You can look at it two ways, I would be always looking at it from a positive point of view. There can be pressure but a lot of the time it’s a healthy pressure. People want you to succeed, they want you to do well. “The pressure that the Kerry public put on us, I think we need that at times and it’s always been part of the Kerry tradition, I don’t see that changing any time soon. “From a playing point of view anyway, it was a tough one to take (last year). We just didn’t perform. Mayo were much better than us on the day. The Dr Crokes man accepts that Kerry need a different approach in 2018 after falling short of their ultimate goal over the past few seasons. “We need something different. We can’t keep doing what we have been doing over the last number of years and expect to get different results. “Definitely, going on last year anyway, I don’t think you saw what Kerry is about and we didn’t feel like we played to the level that we could play to. “I think that we are definitely better than what we would have churned out. But, like the proof is in the pudding and we haven’t produced it so far. “There is no point talking about it or saying it. We have to bring something different this year. For the moment literally we are going to take it game by game. Email “Lecturing Clifford, need for pressure from fans and something different from Kerry in 2018”. Feedback on “Lecturing Clifford, need for pressure from fans and something different from Kerry in 2018”.